Amanda Palmer commands attention. The singer-songwriter-blogger-provocateur, known for pushing boundaries in both her art and her lifestyle, made international headlines this year when she raised nearly $1.2 million via Kickstarter (she’d asked for $100k) from nearly 25,000 fans who pre-ordered her new album, Theater Is Evil. Amanda’s nonfiction book, The Art of Asking: or How I Learned to Stop Worrying and Let People Help, which was released in November 2014 with Hachette and debuted on the New York Times Best Seller list at #7, digs deeply into the topics she addressed in her TED Talk. “Rock star, crowdfunding pioneer, and TED speaker Amanda Palmer knows all about asking. Performing as a living statue in a wedding dress, she wordlessly asked thousands of passersby for their dollars. When she became a singer, songwriter, and musician, she was not afraid to ask her audience to support her as she surfed the crowd (and slept on their couches while touring). And when she left her record label to strike out on her own, she asked her fans to support her in making an album, leading to the world’s most successful music Kickstarter [project]. Amanda’s presentation is 45 minutes in length, followed by 15 minutes of open Q & A with the audience. She is open to other formats, so hosts should feel free to share their ideas with us. Please note: Because Amanda is primarily a musician, the priority in her schedule goes to fluidity – with emphasis on making music and performing. Therefore, Amanda can only consider offers for speaking appearances 3-4 months (or less) in advance of the event date. Amanda’s core topic is The Art of Asking as described below. Part manifesto, part revelation, this is the story of an artist struggling with the new rules of exchange in the twenty-first century, both on and off the Internet. The Art Of Asking will inspire your audience to rethink their own ideas about asking, giving, art, and love. 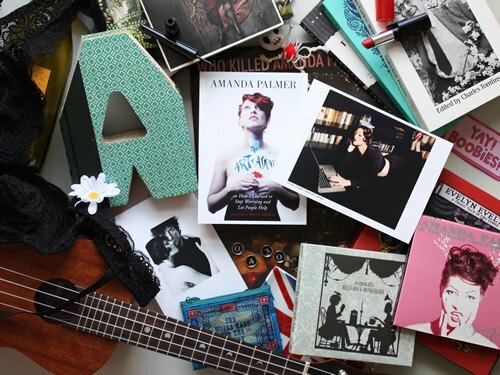 Amanda Palmer is a world-renowned singer, songwriter, activist, director, and blogger who first came to prominence as one half of the internationally acclaimed punk cabaret duo The Dresden Dolls. She is a fellow at the Berkman Center for Internet & Society at Harvard University and has shown her underwear on Australian television. She currently avoids living in places including Boston, New York, and Melbourne with her husband, author Neil Gaiman, who is easily embarrassed. Palmer’s TED Talk, “The Art of Asking,” which she presented at a 2013 TED conference, has been viewed at least 8 million times around the world. Her book, The Art of Asking: or How I Learned to Stop Worrying and Let People Help, was released in November 2014 and debuted on the New York Times Best Seller list at #7. You can visit her website and blog at www.AmandaPalmer.net. Amanda joined New Leaf in the spring of 2014 and this collage photo contains items that reflect the many facets of her life and work. Liquid eyeliner and red lipstick: Amanda draws on her own beautiful eyebrows, varying them to suit her mood. Red lipstick? Why the hell not? Ukelele: Amanda plays several instruments – including the lovely ukelele. 4.30: Amanda’s birthday is April 30th. Books, books and more books: Amanda is a voracious reader and loves losing herself in a great story. British flag: Amanda’s husband is a Brit. Neil Gaiman & Amanda: Husband and wife in a glorious portrait by Allan Amato the day after announcing their engagement. Black bra & boobies reference: Amanda is an unabashed fan of the human form. Evelyn Evelyn, Who Killed Amanda Palmer, Amanda Palmer and the Grand Theft Orchestra, an Evening with Neil Gaiman and Amanda Palmer: All examples of the tremendous creativity and musical genius of Amanda F. Palmer. Wine: Because wine is the balm for just about anything. “She works hard for the money” zippered pouch: Because she does.